D-Dlink's DIR-605L is unique and inexpensive, but not exactly cutting-edge. As Wi-Fi routers go, the D-Link Cloud Router (DIR-605L) isn't a top performer--it has the basic 2x2 antenna array required for 802.11n certification, and its LAN ports support only 10/100 (not gigabit) ethernet. But it boasts some easy-to-use remote-access features that should appeal to small businesses and consumers who want to keep close tabs on network activity without spending a lot of money. Street-priced at a modest $40 (as of May 1, 2012), the Cloud Router supports iPhone and Android apps that let you log in over the Internet and see what devices are connected and what websites they're accessing. If you don't like what you see, you can also use the apps to block connected devices from getting online. These kinds of remote access features aren't new, but the Cloud Router and its mobile apps make them exceptionally easy for even the most nontechnical folks to set up and use. In my tests, the features worked, though with a few annoying glitches. Advanced features are hidden in the basic user interface for the benefit of newbies. Installing the router took me only 10 minutes or so with the aid of the printed quick setup guide. By default, D-Link's browser-based setup interface conceals many advanced networking options that might intimidate newbies; but advanced users can get to them by clicking the Manual Setup button at the bottom of the page. The setup wizard detects broadband type and guides you through creating a Wi-Fi encryption key. To use the remote access features, however, you must also register with the free Mydlink service, which involves creating a user ID and a password. Mydlink started out as a service designed to allow people with D-Link Internet-connected webcams to see images beamed by the cameras, but it is now expanding to add the Cloud Router's networking features. Once you've registered, you can set the router to allow remote access via Mydlink Lite, available as a free Android app or iOS app, with a single mouse click. (Don't pay 99 cents for the Mydlink Plus app; it's for monitoring Web-connected D-Link camera feeds.) When you launch the app and log in, you'll see the router-generated information on network performance, connected devices, and their Web-browsing history. 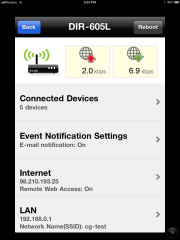 You can also have the app send you an email alert when a new device connects to the router, when a device fails to log in, or when new firmware becomes available. You can reboot the router remotely, or disconnect specific devices from the network. In my tests, I ran into two difficulties: First, the date and time stamps on the Web-browsing history were off, indicating that the activity had occurred in November 2011. D-Link told me that this happened because the router's internal clock hadn't been adjusted during setup, but I couldn't remember being advised to set the router clock at that time. Once I made the adjustment (by going into the advanced manual setup interface), the date and time discrepancies disappeared (though only for browsing that took place after I changed the router's internal clock). Via the cloud, you can block any devices connected to the router. The other problem was that the Mydlink app didn't always show all of the devices that I knew were connected. At first, only a couple of devices appeared on the list. But a few days after I set up the router, more devices began to show up. D-Link officials say that they are looking into this anomaly. Asked whether having the ability to access network information might also expose a user's devices to intruders, D-Link officials pointed out that all of the information comes from the router itself: It doesn't log in to your machines to collect browsing information, for example. Overall, I would recommend the DIR-605L to people who are willing to sacrifice some performance for the ability to monitor network activity from afar. The router's lack of 5GHz support, in particular, is disappointing for city dwellers, who often knock each other off the narrow 2.4GHz band that the Cloud Router supports, and the 2x2 antenna array supports theoretical top speeds of only 300 mbps (new routers with a larger number of antennas are rated at up to 600 mbps). Also, some business users who want a fast wired network for backups or large file transfers will be put off by the lack of gigabit ethernet support. That said, the DIR-605L is probably speedy enough for most general tasks that don't involve a lot of streaming media, and its remote access features will likely appeal to certain small-business owners, parents, and others who want to keep tabs on network activity. The relatively low price should clinch the deal. The D-Link Cloud Router may not win performance contests, but it's inexpensive and it lets you monitor and control network activity remotely via iPhone and Android apps.